On arrival you will be transferred to Chatrium Hotel for three nights. This morning enjoy a 45 minute train journey to the outskirts of town to see the lively and colourful lifestyle of the local people and stop at the Insein Market. 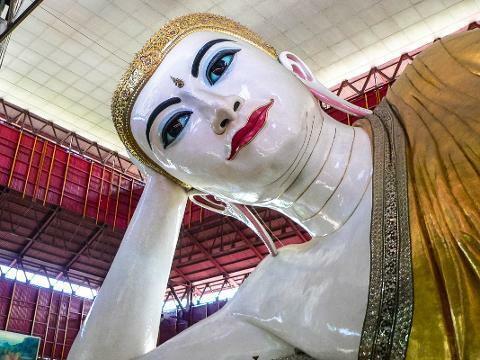 Visit Kyaukhtatgyi Pagoda, home to a 70 metre long reclining Buddha then continue to then continue to the tea shop to experience an integral part of Burmese life – drinking tea! 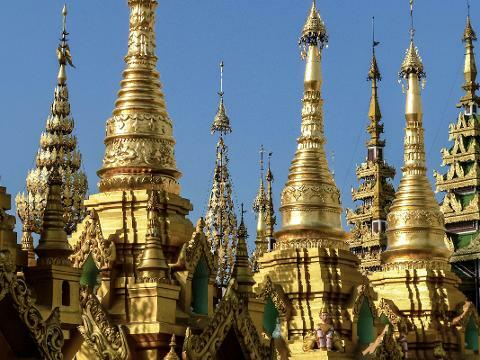 Stroll through the Kandawagyi Park and late this afternoon visit the Shwedagon Pagoda, the most revered Buddhist temple in Myanmar and enjoy the breathtaking sunset. Morning visit to the historic Post Office, walk to Sule Paya and pass by Mahabandoola Garden and the Independence Monument. Visit Little India and Chinatown, then stop at the Bogyoke Market, formerly Scott’s Market and popular for local handicrafts. Fly to Bagan and stay two nights at the Aye Yar River View Hotel for two nights. Visit the elevated Tayokye Pyay Temple for a panoramic view of the plains of Bagan. Stop at the golden stupa of Shwezigon Pagoda for an introduction to the Bagan’s rich historical past then continue onto a cave temple, Wetkyi-In Gubyaukgyi to see the exquisite ‘jataka’ mural paintings. Afternoon visit to a beautiful architectural masterpiece, the Ananda Temple. Join a horse and cart ride to the highest temple of Thatbyinnyu before enjoying an unforgettable sunset from the upper terrace. Start your day with an unforgettable hot air balloon flight (Oct-Mar only) over the plains of Bagan and enjoy the fabulous views as the sun rises over the stupas and Irrawaddy River. Stop at the colourful Nyaung Oo Market and visit a village where the local delicacy poneyay and plum jam is made. Visit a traditional lacquer ware workshop and a local neighbourhood where bullock carts are made. Take a boat ride along the Irrawaddy River to the impressive Kyauk Gu U Min Temple and stop at a farming village for a taste of the local lifestyle. Fly to Mandalay and transfer to the Sedona Hotel for two nights. Visit the ancient capital of Ava and enjoy a horse and carriage travel through the town. Stop at the old wooden Bagaya Monastery and the remains of the Royal Place. Afternoon visit to Mahamuni Pagoda, home to one of the most revered Buddha images and covered with gold leaf. See the production of wood carvings, kalaga tapestries and gold leaf before moving onto Mandalay Hill to enjoy the magnificent sunset over the Irrawaddy River. Embark on a boat trip to the riverside village of Mingun. See the Mingun Bell, the world’s largest uncracked bell and visit the Mingun Pagoda. Travel to Sagaing, regarded as the religious centre of Myanmar and home to 3000 monks and at least 100 meditation centres. After lunch, cross the river to Amarapura and visit the local silk shops and Mahagandayon monastery which is home to nearly 1000 monks. Continue to U Bein Bridge and stroll across the 200 year old teak bridge. Fly to Heho and stay two nights at the Novotel Inle Lake Myat Min Hotel. Enjoy a scenic one hour drive to Nyaung Shwe market then board a motorboat to Inle Lake and cruise past the unique village communities that are built on stilts along the lake. Transfer to Heho for your flight to Yangon and stay one night at the Hotel. This afternoon, take a ferry to Dhala and travel by local trishaw through the town where you can shop at the markets and interact with the friendly locals. 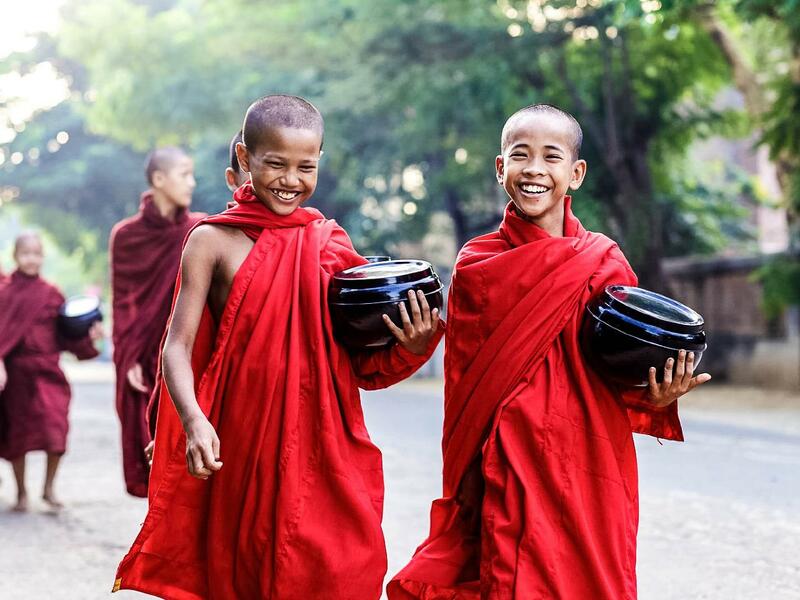 Learn about the monastic life in Myanmar when you visit the monastery which serves as a community centre and an important part of Burmese rural life. Farewell Myanmar as you transfer to the airport for your onward flight.